The organic, family-run operation relies on numerous by-hand processes and 100+ free-ranging animals to produce seven varieties of the sweet fruit. Since 2011, their mail-order operation has developed a fanatical following of date-lovers from around the country. If you want to have the best date of your life, you’ll need to visit 7HotDates.com. Before you balk, you should know the Bautista family—owner of the Bautista Family Date Ranch and the aforementioned website—was a little unsure about the name at first. The name, along with a logo of puckered lips, has done its job. Today the family of date farmers lives and works on a 14-acre property of 1,000 date palms, each of which produce 200 pounds of fruit every year. Their dates are a staple at farmers’ markets from Santa Monica to Palm Springs, and their online store regularly sells out for four months out of the year. 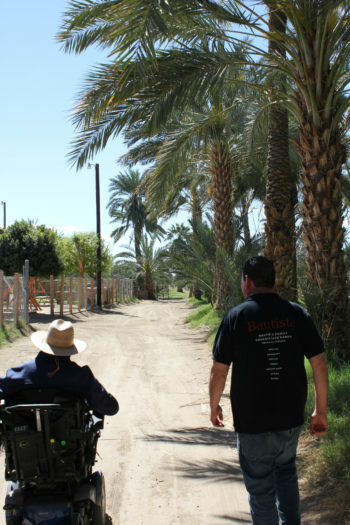 The Bautistas farm dates in the Coachella Valley of California, where more than 90 percent of America’s dates are grown. In contrast to many commercial growers, they practice a more labor-intensive style of cultivation, hand-pollinating their trees instead of relying on mechanized pollination, and harvesting multiple times a year. While most growers allow their dates to ripen to a drier texture on the tree before harvesting once in early fall, the Bautistas begin climbing their trees in August to hand-pick individual fruits at peak ripeness. This attention to variance in flavor and texture has earned them a cult following at farmers’ markets and, with the launch of their online store, around the country. 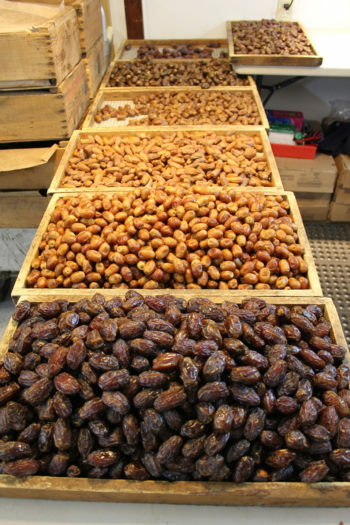 Different varieties of dates await packaging in the Bautista’s processing house. The Bautista Family Date Ranch sits in a desert town called Mecca at the edge of the Salton Sea, an unlikely landmark in the middle of Southern California’s desert. Driving east from San Diego, the 15- by 35-mile Salton Sea appears as a wash of blue against the beige expanse. The sea was formed when the Colorado River flooded its banks in 1905. Cities on its banks enjoyed a short heyday as resort towns, but when the sea’s salinity became inhospitable, and fish started rotting on its shores, vacation destinations transformed into polluted ghost towns. 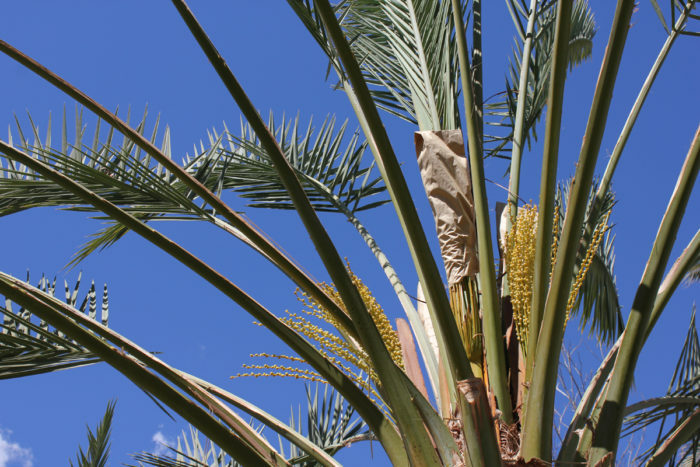 But date palms thrive in this desolate, sandy landscape, with the scorching, 110-plus-degree temperatures, extreme sunlight, and deep underground aquifers producing tender, syrupy dates. Dates were first introduced to America in the early 1900s, after the U.S. Department of Agriculture sponsored global excursions to bring back exotic foods; explorers traveled to the Middle East and returned with offshoots of date palms which they introduced to the Saharan-like valley. Most commercial growers in the region focus on two popular date varieties: deglet noor and medjool. But the Bautistas’ relatively small-scale operation produces seven varieties: medjool, khadrawy, halawy, honey, deglet noor, zahidi, and barhi, each with its own characteristics and flavors. 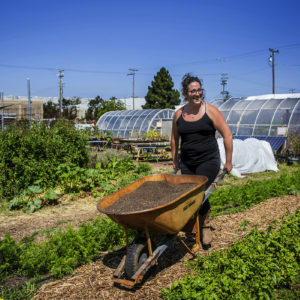 The ranch, which has been farmed organically for more than 50 years, feels like an oasis. Thickly growing palms shade the property. Roosters crow, and a warm breeze rustles the fronds. Pecan, guava, and mango trees supplement the family’s date intake—up to a pound a day during harvest—and a herd of animals roam the ranch freely. The Bautista family’s success has been decades in the making and has not come without its share of suffering. 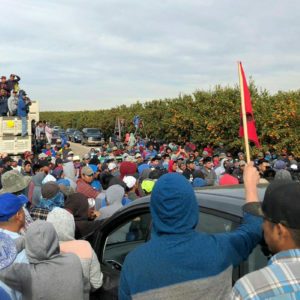 The five siblings’ father, Enrique Bautista, and his wife, Graciela, immigrated to the Coachella Valley from Michoacán, Mexico in the early 1970s. Enrique got his start in agriculture working with grapes and citrus plants and eventually began farming dates. By the late 1990s, Enrique was working as foreman on a date ranch and living across the street with Graciela and their five kids: Alvaro, Maricela, Alicia, Jaime, and Enrique, Jr. When the owners of the ranch retired, they offered the business to him, extending a private loan that made the purchase possible. Agriculture was in the Bautistas’ DNA—the family had spent seasons processing grapes and harvesting apples side by side—so it was only natural that Enrique’s wife and children would join him on the date ranch. His wife and daughters managed the packing house and administration, while his sons oversaw the growing and farmers’ market sales. During harvest season, everyone went up into the trees. Enrique and Alvaro check up on trees at the edge of the ranch. Then in 2004, a car wreck on the way home from a market left Enrique paralyzed. After the accident, the family hunkered down on the ranch. They cut back on markets and sold palm trees, hiring more people to take over Enrique’s work. 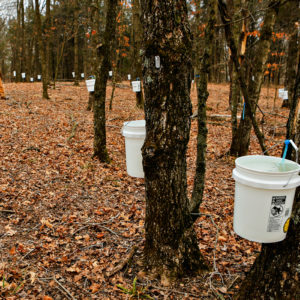 They created paths between the rows of trees so he could still manage his property from an electric wheelchair. Alvaro took over sales, driving hours every day to farmers’ markets across Southern California. Even though the Bautistas banded together, they still struggled to keep the family business afloat. It was a customer’s belief in the value of their fruit that saved the ranch. Pro bono, she designed the website 7HotDates.com, a play on the high temperatures that coax the palms into producing. The new name and website, launched in 2011, created a buzz at farmers’ markets and directed a surge of customers to the online store. Once the Bautistas could field orders online, they discovered a community of date aficionados around the country who were eager for fresh dates of all varieties. Their five to six mail orders per week shot up to dozens per day—and now they sell up to 90 orders a day during harvest season to customers as far away as Canada. While most customers pay online with credit cards, the Bautistas still offer to take payments by an honor system, a return envelope tucked in each box of dates. And they still work together. Alicia is the office manager; Alvaro is a farmer and farmers’-market salesman; and Maricela runs the packing house. Enrique’s other two sons live and work nearby, and Enrique continues to oversee the ranch from his scooter-friendly pathways. Although many things have changed since the Ranch’s early days, the Bautistas have remained committed to certain practices, like minimal processing. While many commercial date growers subject their fruit to hydrating, dehydrating, steaming, and glazing to maintain the fruit’s appearance and shelf life, the Bautista’s dates are never steamed, frozen, or heated and are packaged in their natural, pit-in state. Additionally, one of Enrique’s first decisions as owner was to pursue organic certification. The ranch’s first farmers registered the property as organic, and having worked on conventional orchards around chemicals and pesticides, Enrique wanted his own ranch to be free of toxins. The Bautistas began the organic certification process in 1999 and received their official certification in 2002. Alvaro demonstrates the by-hand thinning technique for young medjool buds. As a certified organic operation, the Bautistas use free-ranging goats, cows, sheep, chickens, and even peacocks—known for killing snakes—to manage the property. Rather than relying on the pesticides used by conventional date farms, the ranch relies on animals to keep pests and date predators at bay. “We have a zoo,” says Enrique of the more than 100 animals that do their part to eat pests, trim weeds, graze on the cowpeas cover crop, and fertilize the soil with organic matter. The animals’ manure alone accomplishes 80 percent of the soil building. Whereas since the 1970s, many commercial growers—certified organic as well as conventional—have turned to mechanized pollination methods to save time and labor, the Bautistas hand pollinate every tree on the property each spring. 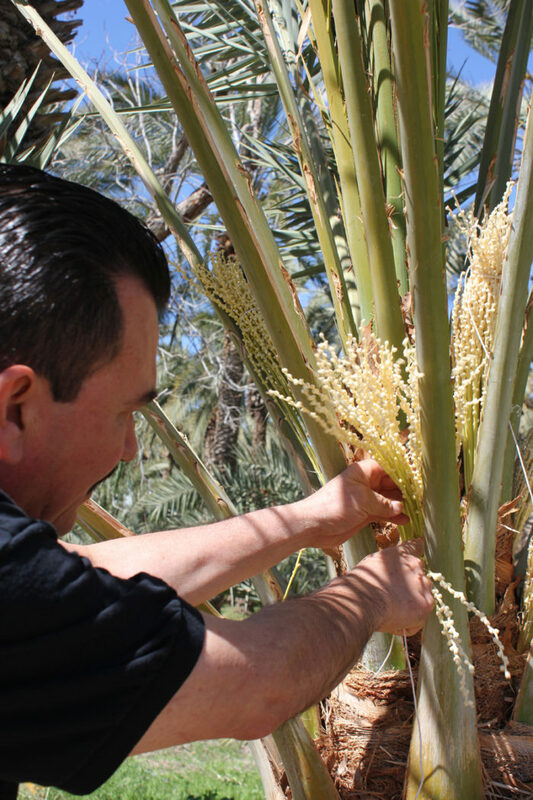 When the male palms that ring the ranch begin to blossom, Alvaro and other employees harvest their pollen and dust it on the stalks of the female trees individually —a more labor-intensive method, but one that ensures thorough pollination of every palm. Once pollinated, in lieu of using pesticides, they hand-tie cloth bags around their dates to protect them from birds and bugs. Pollinated date bunches are covered in paper to contain the pollen. This attention to their customers’ preferences is what sets the Bautista’s dates apart. While most date producers harvest only once in October, the Bautistas are up in their trees by August, as soon as the dates are ripe. This makes for trickier packing—younger fruit is sticky and retains moisture—but it also means they capture a flavor and texture rarely found elsewhere. After August, they harvest once or twice more, allowing them to monitor the fruit and pick every date at peak ripeness. This isn’t the most efficient way to harvest, but the Bautistas aren’t after efficiency. They’ve built a successful ranch and a loyal fan base out of two things: hard work and care—for both their customers and their trees. 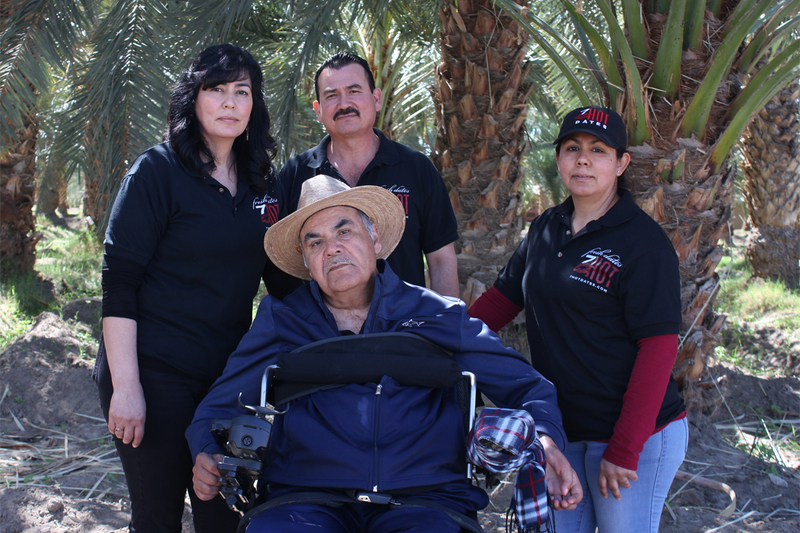 Top photo: Enrique Bautista, owner of the Bautista Family Date Ranch, sits in front of his children Alicia (L), Alvaro (middle), and Maricela (R). All photos © Annelise Jolley. Please let me know when I can order online. I live in Canada. Thank you, and I pray for a good crop! thank you for your hard work love and respect for the Eartg. My grandfather has fruit trees in our small lot he would get up as if going to work to take care of the orange trees the pomegranate, figs and guavas, the kids in the barrio would ask him fir guavas, the fruit grown was like none i have ever tasted and the fruit trees blessed with abundance. May you continue to be abundantly blessed for your love and respect for the blessings of the Earth. A special greeting to you and a successful work. I am Ali from Algeria, specifically from the south of Khenchela province, when I saw the date palm cultivation. I wish I had a job in your farm. Is that possible? Thank you.